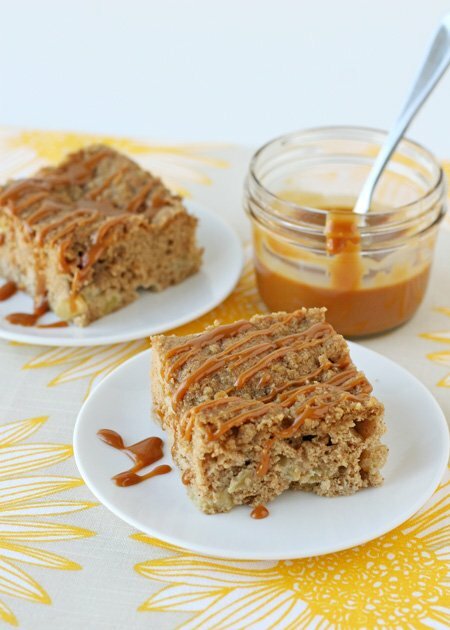 What better way to celebrate fall, than with the flavors of caramel, cinnamon and apples? 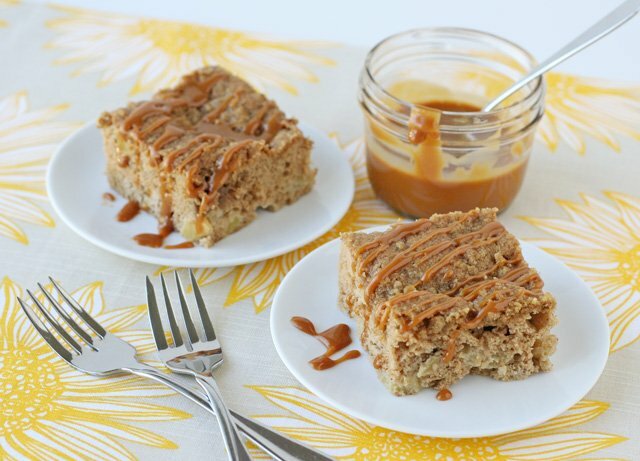 These classic fall flavors combine to create a flavorful and delicious coffee cake. 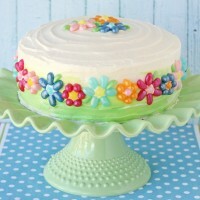 This cake would be perfect for a special breakfast, brunch, or snack anytime. 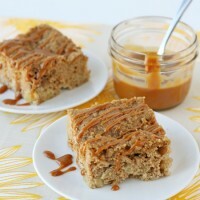 The apple-cinnamon coffee cake is delicious on its own, but the addition of the caramel drizzle makes it extra special! 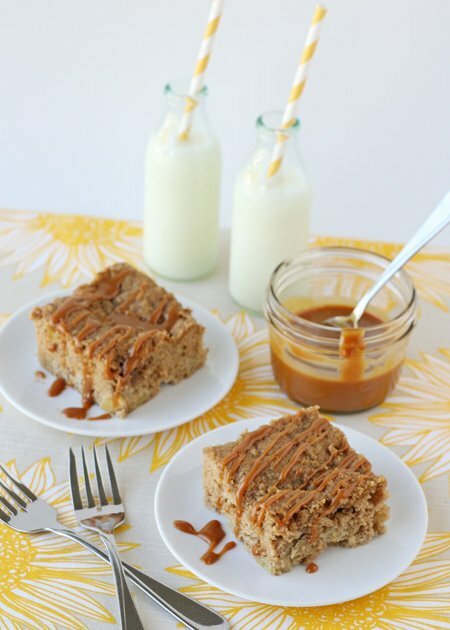 Serve this delicious cake with or without the caramel drizzle for a special breakfast, brunch or treat anytime! Preheat oven to 350*F. Grease a 9"x13" baking dish or cake pan with butter or cooking spray. In the bowl of an electic mixer, beat butter until smooth. Add brown sugar, and beat until light and fluffy. Add the eggs, one at a time. In a separate bowl, add flour, baking soda, cinnamon and salt. Whisk together. With the electric mixer on low, add about 1/2 of the dry ingredients to the butter mixture. Add 1/2 of the sour cream, then remaing dry ingredients, then remaining sour cream. Add vanilla. Turn off mixer, and fold in chopped apples. Combine the topping ingredients in a bowl, stir (with a fork) until mixture resembled coarse crumbs. Sprinkle topping over cake batter. Bake cake 35-40 minutes, until golden brown. Cool on wire rack at least 10 minutes. Melt caramel bits and cream in a bowl in the microwave, or in a small saucepan on the stove, over low heat, stiring to combine. Drizzle caramel over cake slices before serving. Notes- Look for the caramel bits near chocolate chips in your local grocery store. As an alternative, feel free to use large, individual caramels, but they will take more time to melt. I definitely need to try this – thank you! Do you think pears would work — I have a pear tree loaded with fruit. Yes, feel free to experiment! 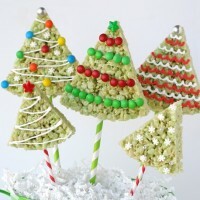 I think a crisp variety would work best, and it’s certainly worth a try! This sounds wonderful, I’ll be trying it soon! This indeed says fall! I love the idea of drizzling caramel over top. What a pretty and sunshiny photo to look at this morning! Wow, I need to make this for my face! I’m afraid I won’t find any caramel bits here in germany. Do you think I can use hard candy caramel as a substitute or has the caramel to be soft? Yes, I would recommend using a soft caramel. You could also use a good quality caramel sauce from the store, or of course make your own caramel sauce. Do you have the recipe for home-made caramel? oh I sort of want to just eat the sauce, is that wrong? Just finished making this recipe. Waited about 10 min after it came out of the oven before I tried it. I couldn’t of imagined it coming out so good! Was absolutely delicious! Thanks for the great recipe!! Thank you SO MUCH for this recipe! I have been looking for a new coffee cake recipe as of late. Got a “job” out of the house (bleh, but necessary). Sure do miss following you as often as I was able too when I was at home, but trying to get caught up. Miss you, friend! That drizzle sounds amazing and the cake looks wonderful. A great Fall dessert for sure. DEAR GOD this recipe is divine!!!! Simply delicious!!! Carmel and apple, two of my favorites! I can feel myself getting fatter already. I think I’ll print this off and use it during the holidays. I really want to give this lovely recipe a try, but I can’t find the caramel bits around the supermarkets here. What would you recommend to replace them with? Yes, as mentioned in the recipe notes, feel free to use larger individual caramels (such as Brachs or Milk Maid). Or you could use a good quality parpared caramel sauce. I want to try this as a cupcake, what frosting would you recommend? I made this recipe, and it is absolutely delicious!! Thanks for sharing! Hi! There is no coffee in the cake. The term “coffee cake” is a term used to describe this style of cake, a quick cake usually with a crumb topping, that is often served with coffee. Love your recipes, can’t wait to start with the Banana cake and apple coffee cake. 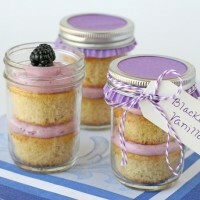 Thanks for sharing love your blog just found you off Pinterest.